First Samnite and Latin Wars, 343-338 B.C. Second (the Great) Samnite War, 326-304 B.C. Third Samnite War, 298-290 B.C. The hill-dwelling Samnites, whose territory covered the vast mountainous regions of central Italy, were the most difficult of Rome's neighbors to subdue. There were three Samnite Wars which lasted over a period of fifty years. In spite of numerous set backs, each war was concluded on terms that increased Rome's power and by the end of the third Samnite war, Rome controlled all of central Italy. First Samnite War and the Latin War : 343-338 B.C. The first Samnite war began when the plain dwellers of Campania requested Rome's assistance to fend off attacks by her highland neighbors. The conflict was brief, consisting mainly of a decisive Roman victory at Mount Gaurus. The war was brought to a close by the revolt of Rome's Latin allies, a conflict which was resolved by the Battle of Vesuvius. After the first Samnite War, Campania, with its chief city of Capua, became a Roman protectorate. The first Samnite war is best known for two famous anecdotes of the associated Latin War. The first, is the famous charge by Decius Mus, who was told by an auger that if he died in battle, the Romans would prevail. The second is the harsh treatment of Manlius Torquatus towards his son, who had fought single-combat with a Latin against his orders. Fought B.C. 342, between the Romans, under Valerius Corvus, and the Samnites. The Romans won a signal victory. Fought near Mount Vesuvius, B.C. 339, between the Romans, under Manlius Torquatus and Decius Mus, and the Latin army. The Roman left was repulsed, but Decius Mus, sacrificing himself for the army, sprang into the midst of the enemy and was slain, and his soldiers following him, renewed the conflict. Manlius now brought up his veteran reserve, and the Romans breaking the Latin line, slew or captured nearly three-fourths of their opponents. The Roman loss, however, was so heavy, that they were unable to pursue. Valerius Corvus Defeated a gigantic Gaul in one-on-one combat; lived to be 100. Manlius Torquatus Consul who slew his son for a minor disobedience. Second Samnite War : 326-304 B.C. A ROMAN ARMY PASSING UNDER THE YOKE. The Second Samnite War was the longest and most fiercely fought of the three, lasting over twenty years. A few years into the war, the Samnites captured a Roman army in a defile called Caudine Forks. Instead of killing the army the Samnite chief released them, in return for favorable terms from Rome. This humiliation infuriated the Romans, but resulted in five year lull in hostilities. Still the war dragged on, alternating between Samnite victories, such as that at Lautulae, and Roman victories, as at Ciuna. It was a war of attrition, but the Samnites suffered more. After they failed to relieve the siege of Bovianum, their capital, they sued for peace. Fought B.C. 322, when four Roman legions, under T. Veturius Calvinus and Spurius Postumus were entrapped by the Sabines under Pontius, in the narrow pass of Caudium. The Romans fought till nightfall, suffering heavy loss, and next day, finding every exit from the pass barred, the survivors surrendered. Fought B.C. 316, between the Samnites, under Pontius, and the Romans, under Q. Fabius Maximus. The Romans were defeated with great slaughter. Fought B.C. 315, between the Romans under Caius Maenius and the Samnites under Pontius. The Romans gained a signal victory. Fought B.C. 307 between the Romans under Titus Minucius, and the Samnites under Statius Gellius. Gellius attempted to relieve Bovianum, which the Romans were besieging, and was totally defeated, though Minucius fell in the battle. This defeat broke the Samnite power, and they sued for peace in the following year, leaving Rome without dispute the first power in Italy. Caius Pontius † Samnite general who captured the Romans at Caudium Pass. Fabius Rullianus Hero of the Battle of Sentinum, against the Gauls and Samnites. Third Samnite War : 298-290 B.C. The peace lasted only a few years however. By 298 B.C., the Samnite made an alliance with the Etruscans and Gauls in Northern Italy to defeat Rome. 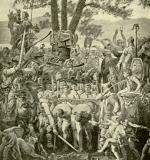 The fighting got off to a disastrous start, as a Roman army was routed at the battle of Camerinum. Shortly thereafter, Rome raised four legions to meet the Samnites and their Gallic allies in a colossal battle at Sentinum. The result was a decisive victory for Rome with very heavy losses on the Samnite side. Although Samnium did not sue for peace after this battle, it could make only a feeble resistance. In the final battle of Apalonia the Samnite camp was looted, their city taken and many of their warriors slain. When Rome offered peace to their most persistent foes it was finally accepted. Fought B.C. 298, between two Roman legions under Lucius Scipio, and the Samnites under Gellius Equatius, aided by a force of Gauls. Scipio, who had been stationed near Camerinum to watch the pass through which the Gauls were expected to cross the Apennines, was unable to prevent the junction of the two armies, and was totally defeated, one of his legions being cut to pieces. Fought B.C. 298, between five Roman legions, under Q. Fabius Maximus and Publius Decius, and the Samnites and Gauls, under Gellius Equatius. The Roman left was disordered by the war-chariots of the Gauls, but was rallied by Decius, who restored the battle, but at the cost of his life. On the right the Samnites were routed, and Fabius then fell upon the Gauls in flank, and broke them. Meanwhile the Samnite camp was attacked, and Equatius slain, the Romans gaining a signal victory. The losses of the victors amounted to 8,200, while the Gauls and Samnites lost 25,000 killed and 8, 000 prisoners. Decius Mus † Son of the Decius Mus who sacrified himself at Vesuvius, he died heroically at Sentinum. The son of Torquatus, provoked by the taunts of the Latin champion, rode out from the ranks. The youth laid the arms he had taken from his foe at his father's feet. Roman Army Passing Under the Yoke.